The hip new shiny thing for a new company is to position themselves as a service. Stepping back from the hype machine for a minute, can you really identify a service provider when you see one? Or are the companies that sell themselves as services are actually tools. And what differentiates a tool provider from a service provider? A tool is designed to deliver a single unique function, such as a hammer or Twitter. Yes, Twitter is a tool. It is designed to take customer input in a variety of formats and from a number of sources and blast that content out to a variety of other formats and destinations. Twitter is the tool. The items that feed into Twitter could be other tools (Tweetdeck as an example), or they could be true services, such as Ping.fm. What separates these two? TweetDeck is a tool that feeds input into Twitter, and helps you manage output. Ping.fm takes your input, and sends it where you what, modifying the format appropriately and hiding it all from you. It took the complexity of a problem (How do I post to multiple social media sites simultaneously?) and delivered a service solution, not a tool solution. The problem with tool providers is that the problem, no matter what it is, always is a great for their tool. All customer problems fit neatly into the boundaries of what they know, and can be solved by what they sell. Tweetdeck’s answer to helping you with Twitter is to give you more Twitter your way. But it doesn’t extend or build on Twitter to create something that is truly new. Solution providers look at the customer problem and see something new. The team at Ping.fm took a look at their personal social media management issues and found a way to create a social media input service. FriendFeed and FaceBook looked at the social media world and created a social media output service. While tools are cool and shiny, they inevitable face the “Hammer v Screw” moment. The point when the tool reaches the outer ability of it’s ability to be useful. Having many different hammers isn’t the solution. Heck, throwing in a wrench and a screwdriver isn’t the answer either. You’re still just selling tools. When you step back and think about your business, when you consider what you deliver to your customers, can you really say that you deliver a service that extends and adds value to the tools you have at your disposal, that you are providing to your customers? Or does everything just look like a nail? Once again it is time to analyze browser usage in the US for the last month. July saw the appearance of Firefox 3.5, which has replicated the pattern seen with Internet Explorer 8, where it supplants the previous version slowly and linearly as people get around to upgrading. Can MSIE 8 overtake MSIE 7 in August? How much will Firefox 3.5 usage grow in August and will it replace FF 3.0 as the dominant version in the Firefox family? As with previous analyses, Internet Explorer 6 retains its iron grip on the corporate, custom Web application market. The question is not when, but if, this browser will actually fade away. It is unlikely that Internet Explorer 6 will disappear until Windows 2000 and Windows XP percentages are in serious decline. Hiding from the inevitable just makes changes that much more dramatic and difficult. It is not likely that the patterns in the StatCounter data will change until the summer vacation season is over in the US, and students bring their shiny new computers online at the start of the school year. UPDATED: Impressions after the first month can be found here. Poor camera. It was a 1.3MP camera. The quality of the camera varied over time, especially through various OS upgrades I put the phone through. As a T-Mobile customer, the Active Sync and physical keyboard ruled out the new myTouch. The battery life on the G1 ruled that machine out. Then I learned about the Dash 3G on Monday. It was exactly what I wanted. Based on the HTC Snap, this phone is a serious upgrade to the old EDGE/GPRS Dash, which had always interested me. But, I was not willing to settle for EDGE/GPRS speeds. And though the T-Mobile 3G network may not be as built out as the AT&T 3G network, it is likely to improve over time. Now, I have had the Dash 3G since Wednesday night. Comments so far? GMail support. It’s done through IMAP, which is great, but it created a whole bunch of new labels in GMail that weren’t there before. Speed. Very fast, even when looking through folders of images. Camera. While 2MP is pretty low-end these days, it’s perfect for what I’m looking for. Ease of Use. Moving from one OS to another is always a challenge. But, Windows Mobile 6.1 benefits from being like Windows. And as much as you might disagree with that, it is a model that most of the world is used to. Battery life. Not bad, but I am always power-conscious. I only turn the WiFi on at home, and I haven’t fire up the Bluetooth yet. Using mainly the 3G network, battery life appears to be quite good. I plan to put it through a drain test over the next 36-48 hours to see how long the battery truly lasts. Overall, through nearly 2 days, I am very happy with the new phone. If you are looking for a work-ready phone on the T-Mobile network, I highly recommend moving to the Dash 3G. June is one of my favorite months. The sun returns (although in the Boston area there are concerned that it has been replaced by clouds and humidity), the kids get out of school (and get sent to camp), and the outdoor pool opens (and I actually swim in it). 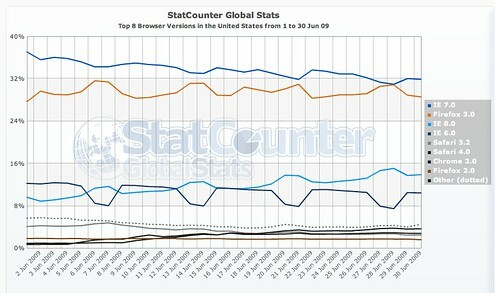 In the US browser market, Internet Explorer 8 continues its slow replacement of Internet Explorer 6 and 7, finally overtaking MSIE 6 on June 11 [Stats courtesy of StatCounter]. The great news is that Internet Explorer 6 is slowly falling of the pace, relegated to large companies with proprietary code and a degree of inertia that impedes their movement to accepting new browsers. 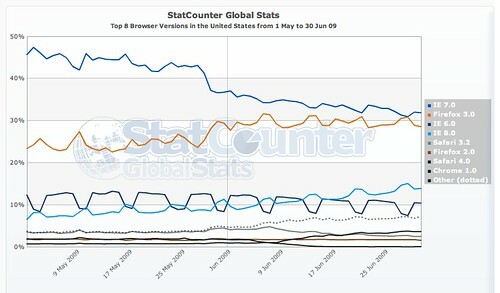 The two-month trend does show some very dramatic changes, most notably with Internet Explorer 7 and Firefox 3. While these changes appear dramatic, the lack of absolute values to base the StatCounter graphs on means that it’s very difficult to determine if these values are a result of a shift in the actual browser market, or a result in decreasing numbers of visitors to sites with the StatCounter tracking code. Worldwide for June, the primary trend is that the decrease in Internet Explorer 7 is matched almost precisely by the increase in the use of Internet Explorer 8. 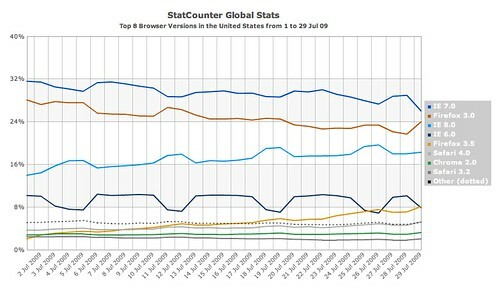 Firefox 3 and Internet Explorer 6 remained almost completely unchanged through June, indicating that the US trend is very different than that seen throughout the rest of the world. 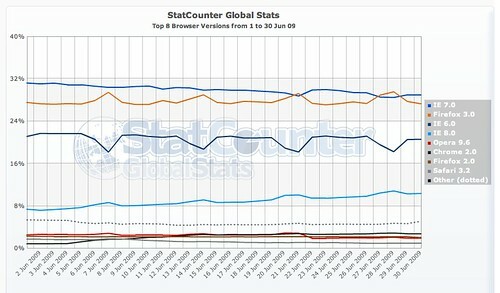 The tracking trend indicates that Firefox 3 could have overtaken Internet Explorer 7 by the end of July. Could have is used purposely here, as the release of Firefox 3.5 will fragment the market share for this browser, and it is not likely that it will match the stats for Firefox 3 immediately. Despite all the claims that the browser war is over, and that applications have moved beyond the browser, it is highly unlikely that this dream will be realized in the consumer browser market until late 2010, when the effect of Windows 7 can be seen on the use of Internet Explorer 8 . Overall, June 2009 was a month of substantial shifts in the US browser market, which will be further aggravated with the release of Firefox 3.5, and the slow and steady adoption of Internet Explorer 8 by consumer and business users. UPDATE: TechCrunch has noted the ongoing shifts to the browser share market [here].